The Nomad has a new temporary home. It is currently ensconced at Quickfit Motorsport at Hornsby having left Joscar on a flat bed truck to have the driveline installed. After doing a monumental amount of research into modernising the handling, performance and braking aspects of the Nomad I packed up the trailer with a swag of parts and headed off to see how good the guys would be at putting the jigsaw puzzle together. I felt we had a better chance of success if I could narrow down the suppliers of the parts to just a few. The theory I used to support this is that a manufacturer would ensure their parts would work well together. Time will tell if the theory will hold water. 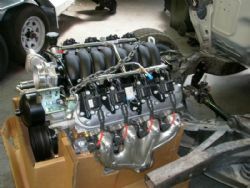 The first point of business is to get the new engine installed. 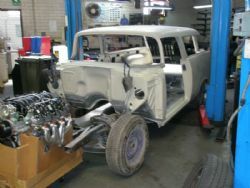 This involves mounting a brand new LS2 crate engine backed by a six speed manual gearbox into the chassis of the ‘57. I was lucky enough to pick this combination up for a bargain price through Preston Motors in the Dandenong’s. The side engine mounts and motor adapter plates were sourced from Street and Performance in Mena, Arkansas in the USA. They also supplied the LS2 air cleaner, MAF and five pin MAF adapter. 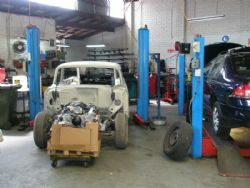 Classic Performance Products in Anaheim, California supplied the transmission cross member, narrowed upper and lower A arms along with Heidts coil over shocks and springs. These guys do a lot of tri five Chevy parts so I sourced two inch drop spindles, a four wheel big disc brake kit with hoses and a front sway bar to get the front end in order and to significantly improve on the fifty one year old soggy sushi handling characteristics. Bringing up the rear is a four link setup with coil overs that will be welded onto a nine inch diff being built to spec in Adelaide. After much deliberation and plenty of advice the original Chev housing and 4.11 open gears are gone and in its place will be a limited slip 3.50 new centre, housing and axles. Once the rear end is mounted a custom drive shaft will be built to provide some forward motion. There are still a few ancillary bits to get including a clutch, manual flywheel and the appropriate brackets to mount the alternator, air conditioning compressor and power steering pump. The plan is to mount the driveline and then pull the engine and gearbox out again so the engine compartment can be sprayed. After this is done the chassis will be removed from the Nomad and blasted, painted and reassembled. A lot will be happening over the next six weeks so stay tuned.....until the next update.